How low should we be on the bike when we get to nasty sections on the trail? How much bend should we have in our knees? Well, essentially, as low as we can get and that’ll give us about 90 degree bend in those knees. There is still a bunch of bad advice circulating out in MTB-land that states that riders should have a slight bend in their knees when they are on the “attack” position. Not so . . . 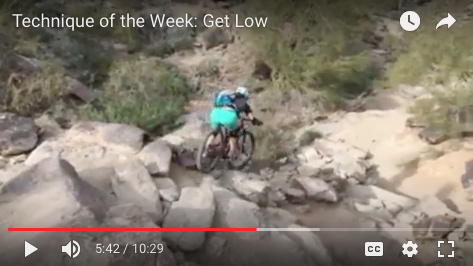 In the video, we’ll see WHY it’s so important to get low and we’ll learn about all kinds of problems we’ll encounter if we remain tall on the bike with straight, or slightly bent knees. Also, check out this other video and watch some of the top riders in the world getting low whenever they’re in the nasty stuff. Thanks for watching. Check back for more! Being low in your attack position helps with all sort of MTB things. I have dedicated this spring to learning to bunny hop, and the first problem to address was my anemic manuals. After looking at all sorts of online vids to absorb their wisdom, I realized that one of several mistakes I have been making was starting from too high up. Getting the waist hinged and the chest low has already helped me attain much longer duration and height on the manuals. Heck, yeah, Dave! The manual is the first half of a good bunny-hop (or, J-hop) that will actually work on the trail. It’s all about starting in that correct position. Get low and use those legs!